I once found a squashed newt in the garden, but suspect that it came into the garden that way, maybe dropped by a passing bird. 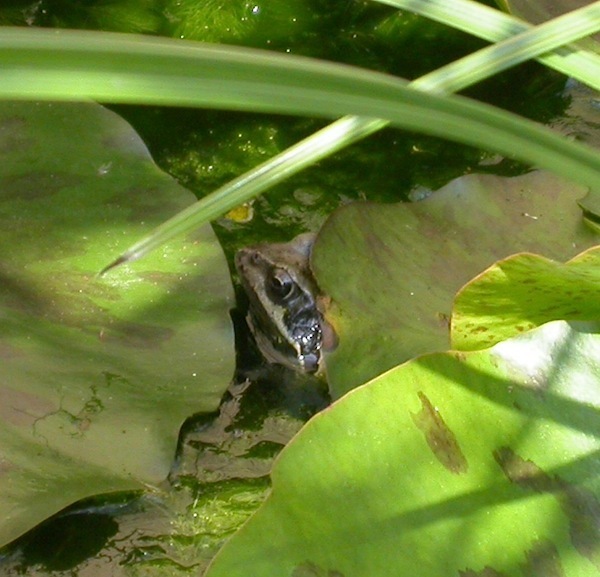 I do, however, have common frogs (Rana temporaria). One lonly male used to sit croaking under my bedroom window in the late spring and summer – pining for a mate. So we transferred some spawn (before this practice was banned) from my father-in-law’s pond and some months later saw a couple of tiny froglets. For a few years nothing much happened except for one spawning attempt that failed when the spawn was not fertilized. Then, this spring some more spawn appeared. We feared the worse when it froze solid in the late winter weather, but later we began to see the black dots change shape and eventually tiny tadpoles emerged. We counted more than twenty tadpoles that stayed in a corner of the pond where the fish couldn’t get to them and grew until, the last time we spotted any they had grown to as much as two inches long and sporting back legs. Fingers crossed the frog cycle will survive weather and neighbourghood cats and go on for many years… if so they will keep the slugs from eating the plants!